As I’ve mentioned before, my malamute is pulling me on a kickbike. This is such a fun way of getting exercise and fresh air with my dog! What I like the most about it is that basically any kind of a dog can do it, it’s not only limited to traditional sled dog breeds. I help my dog when we’re going uphill – it’s not like the dog has to pull me and I’m just enjoying the ride. Yesterday we did a 10 km dirt road track, stopping once by the sea. 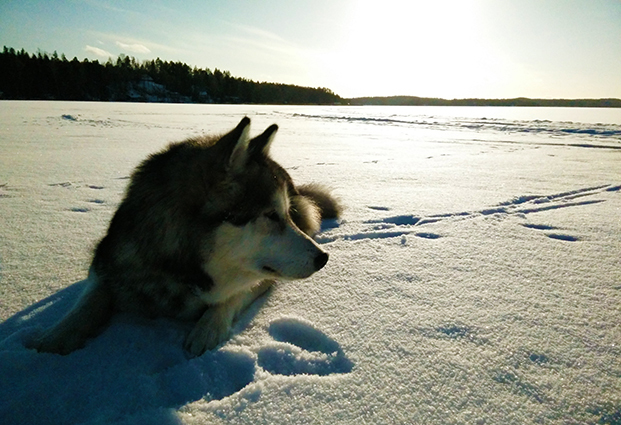 The weather was incredibly sunny and warm, only -3c. We were also enjoying the company of a friend and her husky that is an amazing lead dog. Our hobby would be nothing without them because my dog only goes forward when she has company. She clearly enjoys the competition and will try to pass every time she has the chance for it. 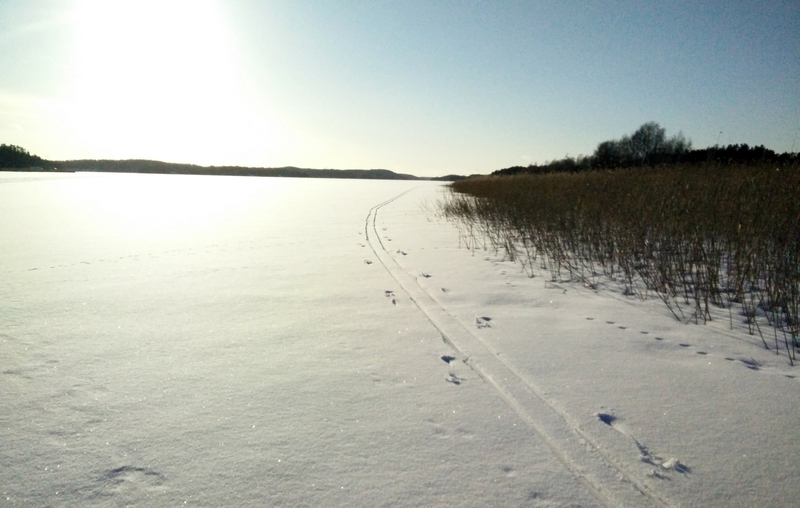 The sea is frozen and the picture above gives a good impression of the snow situation in Southern Finland. Not much but enough for the ground to be covered. I’m hoping for the weather to turn a bit cooler soon so that the dogs can pull a kickspark together on the ice. My kickbike is a Kickbike Cross Max with disk brakes and I’ve been really happy with my choice! I wanted to get the best brakes I could get and the disk brakes are naturally better than the V-brakes. (Nowadays they have a further upgraded version of the brakes.) The bike works well on country roads and that is what I mostly use it on. I think that I’ve driven into every pothole on the nearby dirt road and they don’t feel like a big deal because of the fork’s suspension. The fork suspension has a lock-out that I actually managed to break once when I crashed. Fortunately just the cable came off and fixing the problem was easy! The only problem are forest paths that we often can’t do because the board is quite low and will hit any bigger tree roots or stones and deep snow in which the bike can only be dragged around. The Cross Max I bought has a back mudguard but I had taken it off yesterday in order to avoid snow getting blocked between the mudguard and the tire. I couldn’t imagine that the sun had melted some of the dirt road and after half a kilometer on that road I was covered in dirt. In order to pull me, my dog should stay in front of the kickbike at all times and her leash (with bungee) should be tight so that the leash doesn’t get tangled around the front wheel. This is where my sled dog adapter comes handy! It’s a metal piece that is attached to the front frame and extends over the front wheel. The adapter can be turned to the side so that dogs that don’t want to pull can run on the side of the bike. 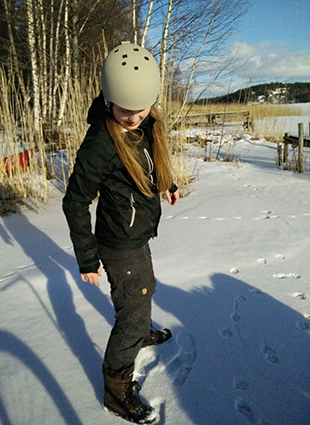 At times when our speed is dropping I feel stupid wearing a helmet but every time I start getting such feelings I just remind myself of the accident last spring that might have ended badly if I hadn’t worn a snowboarding helmet. So, last May we were rolling downhill as fast as my dog could run. The road was a concrete-paved back road with a field on the left side. My dog noticed a rabbit on the field and made a sharp turn to the left. I didn’t react to the situation as fast and flew forward several meters with my head and right shoulder grinding the concrete, finally landing in a ditch. My collar bone exploded into several pieces from the end but my head had no damage despite feeling a little dizzy and having a sore neck for a couple of days.